Oh, the myriad applications of acrylic! 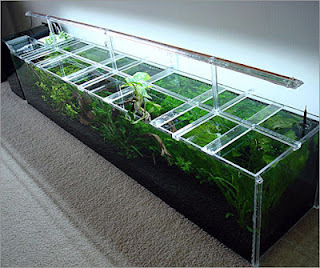 How can it help your terrarium? Last week during "Operation Diagnose" we discussed the idea of keeping a lid on open terrariums for about 80% of the time to retain moisture. 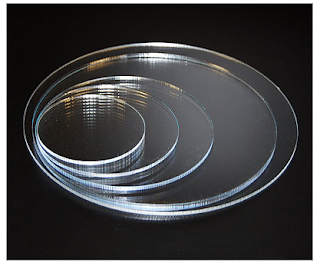 Reader Amanda drew my attention to a TAP Plastics product - laser cut acrylic circles, which would be an unobtrusive way to add a lid to nearly any sized open terrarium. The circles range from 2"- 24" diameter and $.75 - $35 in price. If you have some time to kill, I encourage you to also explore the TAP Projects page to see the creative projects people have completed with TAP products and services. 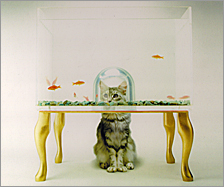 There are some interesting aquarium projects that might have terrarium-type applications, like the above image of the kitty view-dome aquarium.